A couple of months later at a party at her parents’ home, and without hesitation, Richard announced to Jeri’s mother that he was going to marry her daughter! Richard proposed on the beach at Jeri’s parent’s holiday house near Byron Bay where we had our first kiss. 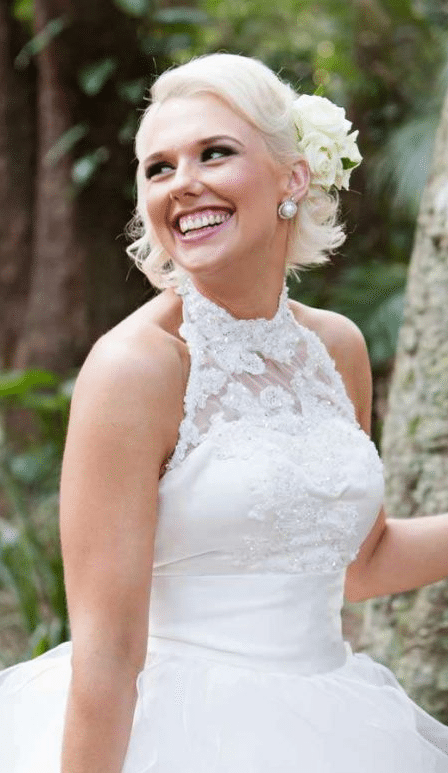 They wanted to continue the beach sentiment so chose Noosa to celebrate their wedding day. We enjoyed every moment of our wedding day and rarely felt stressed out. Thankfully we had the help of a wonderful wedding planner and florist who took the reigns when we most needed it and made the whole planning and lead up to the wedding a really lovely and memorable experience. A chic colour palette consisting of pink, magenta, purple and ivory featured throughout the styling at this beautiful event, and the inspiration for the design concept was drawn from the bridesmaids ‘Alannah Hill’ pink gloves. With a love of bold and punchy colours Jeri incorporated her own individual and personal style to the day’s theming, capturing her personality with dynamic details and glamorous design touches. Jeri’s gown had an overskirt that she wore for the ceremony and then removed for the reception, revealing a mermaid inspired gown to celebrate the rest of the evening in. Jeri has a love of perfume and a perfume station was placed in the ladies bathroom at the reception. Jeri and Richard had a personalised logo which was printed on all of the stationery, menus, signs and guest information.